Chris Hemsworth, on the set of Rush, wears a pair of Carrera 44 sunglasses. 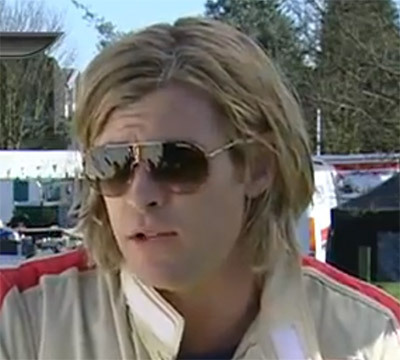 In a behind the scenes interview with Chris Hemsworth on the set of Rush, he wears a pair of Carrera 44 sunglasses. The movie, about Formula 1 drivers Niki Lauda and James Hunt, features Carrera sunglasses as well. Some Carrera advertising signs can be seen on the side of the racetracks. Get the Carrera 44 sunglasses online on Amazon.com, Amazon.co.uk, eBay, or FramesDirect. Actor Daniel Brühl, who plays Niki Lauda, wears a pair of Carrera 80 sunglasses in the film.